Happy Friday!!! You’ve probably noticed that these booties and sunnies have been on MAJOR repeat lately! This outfit from last week is one of my favorites I’ve worn in a while. Those booties and jeans are so so cute. You look amazing, mama! You’re looking so adorable in this outfit! LOVE your velvet boots! This outfit is soooo pretty!! Your hair looks amazing too!!! Love this very spring like!! 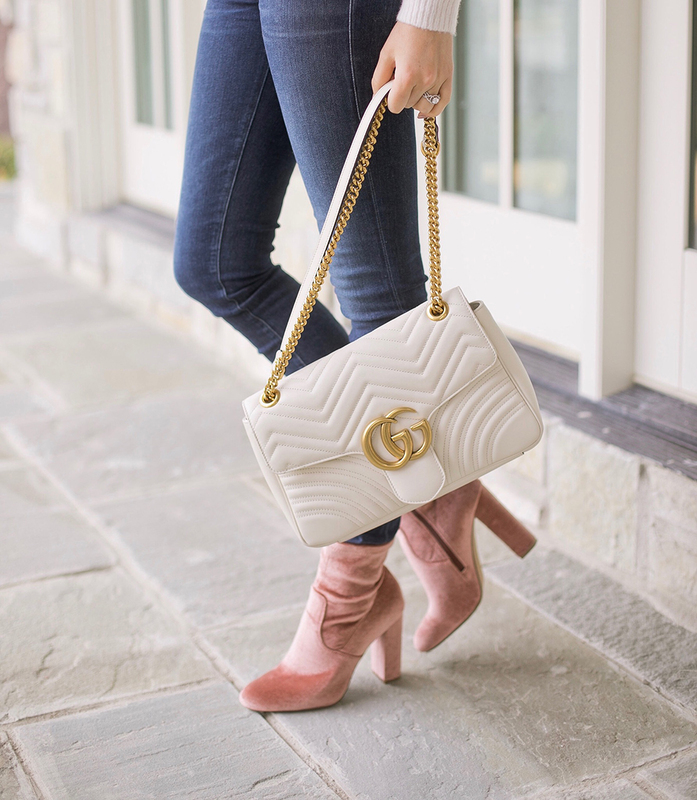 Love those pink velvet boots! So cute! Special request! Do you think you could do a post with more color? It’d be great to see some more variety. Thanks! I’m loving these colors right now, but I’m sure I’ll add more in as it gets warmer here. This look so so cute and perfect for around town. I love the pops of pink! I can def see why those booties are on repeat. Love this look! How the colours work with eachother, the frills on the shirt, and how the jeans look and fit on you. Great look! 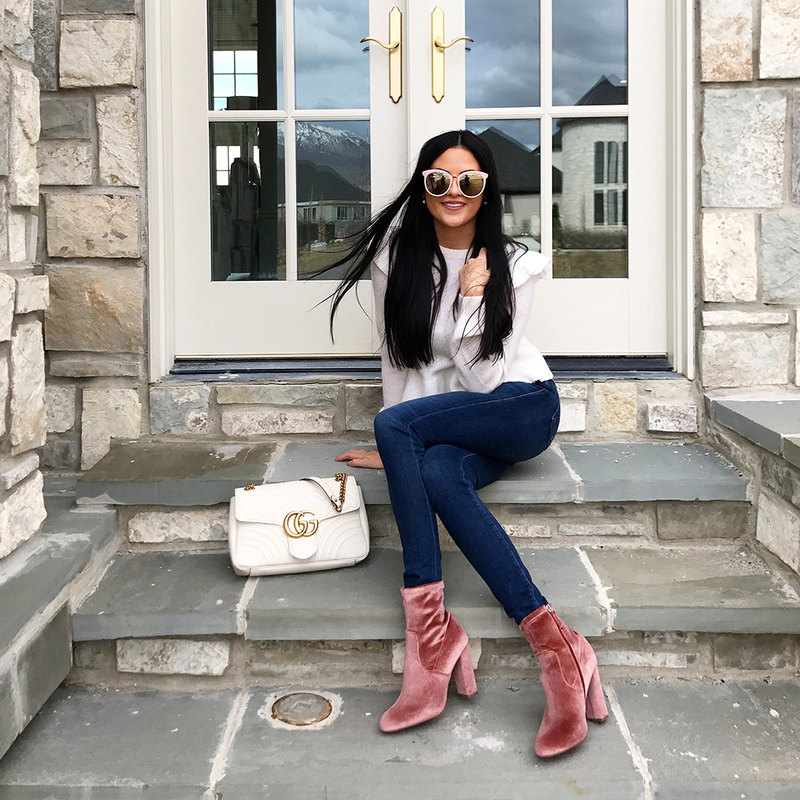 I love those blush velvet boots and how you’ve been styling them lately, they’re so cute and perfect for transitioning into spring! They also look so good paired with that gorgeous Gucci bag as well! Thanks for sharing, beauty, and I hope you have a great weekend ahead! Thanks Jalisa! I agree, they are the perfect spring bootie! Don’t worry hun, I could never get enough of those booties! Love this dressed up casual look…those boots are so fun! Love the pink sunnies and bootie combo! I also love the setting of these photos! So pretty at your home! major crush on these booties! Hope you have a great weekend! This outfit is so cute! I am obsessed with those boots! Such a pretty look! Have a fabulous weekend!! Those booties are amazing!! Like seriously the perfect blush/rose color! This handbag is my favorite, I have the smaller version and love it!!! The sweater is gorgeous on you and looks so good with those booties. Love this look.. is so feminine!!! I can see why they have been on repeat, they’re both so chic!! Thank you, Laura! And so comfortable! I am loving those booties!! I love these sunnies! They’re so cute and it’s fun that you can see your photographer in them haha. Also been lusting after the shoes since you first started wearing them. Haha! It’s great, no way around it! Thanks Lex! Such flattering jeans! Happy Friday! You are so sweet!!! Thank you! Thank you! They are my favorite and I’m convinced everyone needs a pair! That sweater looks so cute on you!! I love this outfit! Super cute, makes me so excited for winter here in Australia this year! Wonderful … I like everything in this outfit! I love this outfit! The purse and boots are my favorite! Those velvet boots are lovely, I love how you styled them! Loving these gorgeous shoes. Perfect way to transition velvet into spring.